As discussed above, SMR and TDMR technologies combined are expected to increase the areal density of HDD platters by approximately 10% to 20% compared to platters used inside of today’s hard drives. Seagate has done a lot to make SMR viable for a variety of applications and we are yet to see the fruits of TDMR. 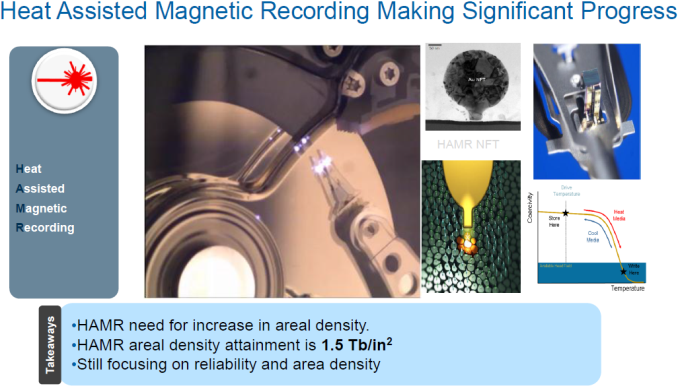 However, keeping in mind physical limitations of PMR and SMR as well as high-cost of helium-filled HDD tech (as of today, according to Seagate), a new magnetic recording technology is needed. Yes, we are (finally!) talking about HAMR. Seagate says that its HAMR heads heat media to approximately 450°C using a laser with 810nm wavelength and 20mW power. Seagate’s current internal HAMR-based HDD have an areal density of about 2 Tb/inch2, which is considerably higher when compared to today’s PMR or SMR HDDs. Potentially, this means that Seagate can increase the capacity of hard drives by 2x just by employing the technology. In reality, not everything is that easy. The device, which heats storage media, is called a near-field optical transducer (NFT). Hard drive makers use gold as the primary NFT material due to its superior optical properties. On the other hand, gold has a comparatively low mechanical strength and such NFTs may experience reflow at elevated temperatures resulting in deformation of the NFT shape. A deformation in shape can reduce coupling efficiency and reduce the amount of light energy transferred to the storage medium, which essentially means a damaged hard drive. This is why Seagate and other makers of HDDs have researched and patented a variety of materials (alloys based on gold, to be precise) for NFT for years now. Seagate does not reveal the alloy it uses for NFTs for now. Nonetheless, Seagate stresses that when it ships its first HAMR-based HDDs for evaluation (in 2017) and then for commercial systems (in 2018), they will be rated to work for a long time, just like today’s hard drives. Seagate does not reveal any data about its HAMR-based HDDs for now, but claims that they can offer several writes per drive per day over five years, which suggests pretty high reliability. Eventually, client drives will also rely on HAMR, but those HDDs are pretty far away from us at this point. The HDD maker is not disclosing any details when it comes to transducer materials. Apart from a durable NFT, HAMR-based HDDs will need a new head (featuring a heater, a writer, and several readers to mitigate the ITI effect), which means a lot of work both on hardware on multiple fronts. In the end, HAMR-based hard drives will aim to add both capacity and performance. But to make everything work, Seagate will have to develop a rather robust platform, which will involve complex controllers in addition to new materials and a number of other things. It should be noted that HAMR is a challenge for the whole industry, not just for Seagate. As a result, as soon as the industry figures out how to make HAMR-based hard drives as reliable as traditional HDDs, the technology will be used right across the board. It's ogre. HDDs are dead. SSDs won. Well, HDDs barely make sense for archival data either, you still can get tapes at less than a fifth of HDD prices for the same capacity. On the other hand, I think SSD builders do keep an ace in the hole by currently not offering 3.5" SSDs. As soon as the prices for NAND-Chips drop into the right region, they do have the chance to drop the $/GB ratio quickly by just adding a significantly higher number of NAND-Chips to a single controller and DDR-Cache. saying a post BS while you saying BS ? 3DXPoint is still new, it have yet to prove it really give 5x better data retention... if already proved then share some legit data.